"Stay!. Do not touch anything! Do not breathe on anything!" Continuing in the tradition of the three previous films in the Beethoven series, we are once again are treated to the predictably wacky antics of the slobbering, oversized St. Bernard. Long gone is frazzled dog owner Charles Grodin, who appeared in the first two, and this installment continues with the Newton family, who were featured in the third film. Also taking part here is director David Evans (The Sandlot, Beethoven's 3rd), and he delivers a cute, but bland kid-friendly twist on The Prince And The Pauper story by introducing another St. Bernard into the mix. Richard Newton (Judge Reinhold) is a stay-at-home dad, doing freelance artwork for a greeting card company. Along with his working wife Beth (Julia Sweeney), as well as kids Brennan (Joe Pichler) and Sara (Michaela Gallo), the Newtons live in one of those overly large, immaculate "average" homes in one of those perfect neighborhoods that doesn't exist anywhere but on a Hollywood backlot. The other member of the family, of course, is Beethoven, the lumbering four-legged demolition squad. Across town, in the big mansions/big money neighborhood, a pampered vegetarian St.Bernard named Michealangelo lives in absolute splendor. The well-heeled doggie not only wipes his feet before entering a home, but uses a toilet (and flushes), meditates, as well as sees a psychic nutritionist and his own shrink (Dr. Joyce Brothers). The dog is part of your standard issue one-dimensional "rich" family; the kind with the self-absorbed mom, absent-minded dad and cute, but lonely young daughter. Unbeknownst to their owners, the dogs are accidently switched during a mix up at the park. The Newtons think their former furry monster (which is now Michealangelo) has become more refined and well-behaved, and consequently the manic Beethoven all but destroys the pricey finery of his new home. An overly simplistic twist involving a devious butler and his bumbling sidekick brother and their plot to kidnap Michealangelo (re: Beethoven) is predictably foiled endlessly by the horse-sized dog. Reinhold and Sweeney give sitcom-worthy performances as the harried parents, and the kids are cute enough. Mark Lindsay Chapman (The Langoliers) as the butler, Simmons, contributes the expected stiff-upper-lipped-Brit type of performance that we've all seen before. 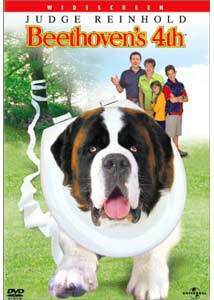 But as with any film starring an animal, it's Beethoven that steals the show. He's a big pooch with less than perfect manners and there is plenty of doggie drool and doggie gas jokes, and the dog's slow motion running scenes, with his comically flopping jowls, which elicited some hearty howls from my daughter Sam. Not required viewing by any means, but a good recommendation for a "family night" rental. Image Transfer Review: Not a perfect image transfer, despite being a 1.85:1 anamorphic widescreen disc. Fleshtones have an unnatural red hue, even though most of the color field remains realistic. Some edge enhancement and ringing problems do little to enhance the overall image transfer. I imagine most of the visual flaws will be obviously overlooked by the younger viewers. Audio Transfer Review: A fairly tame 5.1 Dolby Digital English mix makes limited use of the rear channels, which is not completely surprising considering this is a straight-to-DVD, low-budget family title. Up front directional imaging isn't bad, but is minimal. This is the type of DVD that would play just as well through your television speakers, and I'm sure most kids could care less. A 5.1 Spanish and 2.0 French track are also included. Extras Review: Other than a trailer for the upcoming animated Balto: Wolf Quest, the only extras are cast bios, brief production notes, English subtitles and 18 chapter stops. Beethoven's 4th is a nice, harmless G-rated story with some genuine laughs, believe it or not. Silly villains and predictable plot aside, I would have to say this is a pretty good family rental; if you have tried to get a family-friendly movie lately, you know that those are getting increasingly hard to find these days.